In her New York Times bestseller, The Dovekeepers, Alice Hoffman takes the story surrounding the siege at the fortress Masada (already a pretty fascinating story) and adds a whole new element of interpersonal intrigue. The fictional element has an interesting way of making the story actually seem more real. The two evening mini-series based on the book (created with author herself) takes the story a whole other step further by letting it jump off the page and onto your screen. 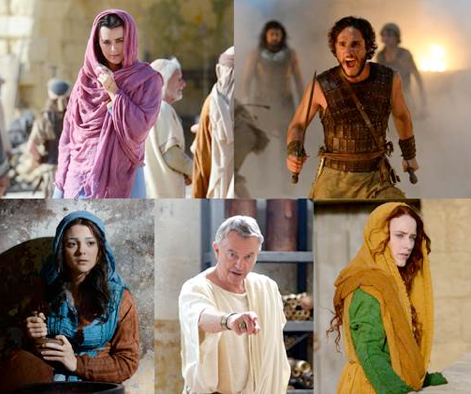 Set in ancient Israel, THE DOVEKEEPERS is based on the true events at Masada in 70 C.E. After the Romans force them out of Jerusalem, 900 Jews were hole up in a seemingly impenetrable fortress at Masada, a mountain in the Judean desert. Once the fortress is attacked, the Jews hold out for months against a massive Roman onslaught. Yael, Aziza and Shirah are three women who all end up working in the dovecote at Masada–each has a number of secrets and an important part in how the interpersonal drama at Masada unfolds. Even though some of the Hebrew was a little but rusty and a couple of details seemed a touch incongruous, I found myself completely unable to stop watching for even a moment. Cote de Pablo, Rachel Brosnahan and Kathryn Prescott each fully embodies her part as a piece of the dramatic puzzle and Sam Neill is able to makes the historian Josephus seem sympathetic. I had a hard time believing in some of the male characters, but, since the story really centers on the women, perhaps that doesn’t really matter. THE DOVEKEEPERS is a four-hour limited event series from executive producers Roma Downey and Mark Burnett and will be broadcast Tuesday, March 31 and Wednesday, April 1, 2015 (9:00-11:00 PM, ET/PT). Photos and video courtesy of CBS Television Networks. This entry was posted in television shows and tagged alice hoffman, the dovekeepers on cbs by jessica. Bookmark the permalink.